We finished up day 4 of our adventure by leaving Kennebunkport and heading up I 295 N toward Bar Harbor. The road meandered through Portland, Brunswick, Augusta and Waterville, before it turned into I 95 and hooked east toward Bangor and, finally, Bar Harbor. The town of Bar Harbor sits on Mount Desert Island which is also home to the Acadia National Park. As we were pulling onto the island, our first order of business was finding a place to stay. Carter and I were googling some possibilities. He found something called Acadia Inn, which Dede and I were a little worried about because we didn't know anything about it. We were thinking of a chain where we might know what to expect. I found a Days Inn, so over Carter's objection, we decided to check it out. It is such a good thing we asked to see a room before we booked. We were not impressed. The whole place looked rundown and dated. We knew right away there was no way we were going to stay there. Carter looked kind of happy when we told him my selection didn't work out, so we agreed to scope out the Acadia Inn. Let's just say, Carter is a better motel chooser than I am. Not only was Acadia Inn closer to downtown Bar Harbor and the national park, it was brighter, cleaner and altogether a much better accommodation. We checked in, unloaded our suitcases and decided to head into town. Bar Harbor is a quaint little seaside town. It has that weathered look you expect when you think of a rugged coastal Maine town. There are shops and eateries sprinkled up and down the narrow streets. Parking is limited, but we finally found a parking lot and snagged a space. We realized we were getting hungry and our hotel staff had recommended a place called West Street Cafe, so that is where we headed. Luckily, it was just a short walk from our parking spot. West Street Cafe occupies a corner on a road which crawls along the water's edge named, not surprisingly, West Street. The clapboard building was happily painted a bright seaside blue with white trim. It was so welcoming that Dede and I went right on in. Carter was having no part of it, so he opted to wander around town while we ate. Dede and I were on a mission. We were not leaving Maine without sampling a real lobster dinner and blueberry pie. As we studied the menu, we couldn't resist a Maine blueberry martini. We were off to a great start! There were several options on the menu when it came to ordering lobster. You could get the whole lobster, tail and claw, or only the tail. Dede decided to get the tail and claw. I got something called the Downeast Special which came with clam chowder and blueberry pie. We were going to split a piece of pie anyway, so the chowder was just a bonus. Along with the chowder, our server brought out some fresh bread. The bread was hot and delicious and the chowder was creamy and thick. One thing that Dede and I noticed about Maine was the oyster crackers that accompany the chowders. They are not like the wimpy little oyster crackers we have back home. No! Mainiacs are serious about their oyster crackers. They are huge and puffy. Our lobsters arrived with melted butter and lobster bibs. This looked to be a messy proposition. If the lobster special hadn't been such a good deal, honestly, the claws and tail make more sense. Once I had worked my way through those, I was left with the head and body with which I had no idea what to do. By the time I got to that section, Carter had rejoined us. He was just in time to see me pick up the body and see my shock when a big green blob plopped onto my plate. Dede was oblivious, but Carter and I exchanged looks of horror. What in the heck was that thing? I have never seen anything so disgusting. We busted out laughing and filled Dede in on what had just happened. She was glad she wasn't paying attention. My curiosity was killing me, so of course I had to google "green blob in lobster" to find out if this was normal or if I had just eaten a rotten lobster. I was relieved to find out the green thing, while still disgusting, is normal and not a sign of a ruined crustacean. It is called the tomalley and is like a combined liver and pancreas for the animal. Yuck, I know! However, some people consider this lobster paste a delicacy and smear it on bread or crackers. Whew! We were ready to get rid of that and move on to the blueberry pie. West Street Cafe served our blueberry pie al a mode and it was delicious. We left the restaurant stuffed and decided to wander around to check out the shops of Bar Harbor. Built in 1886, the oldest bookstore in Maine is in Bar Harbor. I love bookstores, so I couldn't resist checking out Sherman's Book Store. While we never saw a real moose, we saw moose motifs everywhere. Carter, who had not gorged himself on lobster, wanted to check out a place called Ben and Bill's Chocolate Emporium, so we moseyed on in. The place was chock full of candy and sweets, in addition to a dizzying variety of ice cream. One thing that caught my eye was, and no, I am not making this up, lobster ice cream. Sounds right up there with a tomalley on the deliciousness scale, doesn't it? Well I am nothing if not a trooper, so I actually took a small taste one of the employees offered me. Let's just say, I have done it and I am not going to do it again. I cannot even begin to tell you how peculiar it was, but it was every bit as odd as it sounds. Thanks to me, you can just skip this and go directly to the chocolate when you visit Chocolate Emporium. You're welcome! I can't remember what flavor Carter ordered, but I do remember he was pretty happy with it. He did not try the lobster ice cream. We could not wait until morning to venture on into Acadia. For those of you who have been to the Smoky Mountains National Park, picture that park, but with ocean views. That is what Acadia reminds me of. We happened to be driving through on the night of the strawberry moon, so we were treated to some spectacular night views of the park. The giant moon lit everything up. It was just beautiful. At one point, Carter spotted a fox sitting on the side of the road. We stopped and told Carter to take a picture for us. This is what we got. You can find the fox if you look for the white dot in the middle of the photograph. We laughed for a while over Carter's excellent photography skills! After driving around for a while, we headed back to our room for the night, to get rested up and ready for the next day. We couldn't wait to see Acadia in daylight and we also were anxious to take a trip on a real lobster boat. 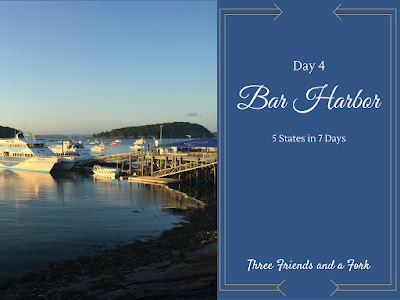 Next time we will tell you about day 5 in Acadia, plus popovers, lobster boats and seals, oh, my! Until then, Three Friends and a Fork give 3 Crusty Yums UP to West Street Cafe and Ben and Bill's Chocolate Emporium.